VANCOUVER, British Columbia, Nov. 27, 2018 (GLOBE NEWSWIRE) -- FIREWEED ZINC LTD. (“Fireweed” or the “Company”) (TSXV: FWZ) is pleased to announce closing of the previously announced sale and purchase agreement with Teck Metals Ltd. (“Teck”), a subsidiary of Teck Resources Limited (TSX:TECK.A and TECK.B, NYSE: TECK), to acquire the Nidd Property on the western extension of the Macmillan Pass Zinc Project in Yukon, Canada. With this acquisition Fireweed has consolidated the Macmillan Pass Zinc District and now controls 544 square kilometers of highly prospective zinc claims including all four known large zinc mineralized systems in the region – Tom, Jason, End Zone and Boundary Zone – as well as many other zinc exploration targets including the entire highly prospective “fertile corridor” of exploration targets extending from Tom to the Boundary Zone and beyond (see attached map and Fireweed news release dated November 6, 2018 for details). Under terms of the agreement, Fireweed acquired 100% interest in the 372 Nidd claims for a purchase price of 1,500,000 shares subject to a one year lock up, and Teck retains a 1% net smelter return royalty and has a right of first offer to purchase from Fireweed, future production concentrates from the Nidd Property. 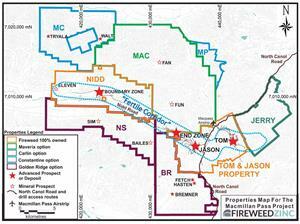 “Adding the Nidd Property to our holdings is a major milestone and for the first time in history the Macmillan Pass Zinc District is consolidated under one owner, Fireweed. After the Tom and Jason properties, Nidd is an important piece of this district not just because of the established mineralization, but because of the property’s prospectivity for the discovery of new mineralized bodies. We are thrilled to have made this transaction and welcome Teck as a major shareholder,” stated Fireweed CEO Brandon Macdonald. Technical information in this news release has been approved by Brandon Macdonald, P.Geo, CEO and a ‘Qualified Person’ as defined under Canadian National Instrument 43‑101. Additional information about Fireweed Zinc and its Macmillan Pass Zinc Project, can be found on the Company’s website at www.FireweedZinc.com and at www.sedar.com.